We have a VERY cute Husky(see our picture) who is looking for a new home. 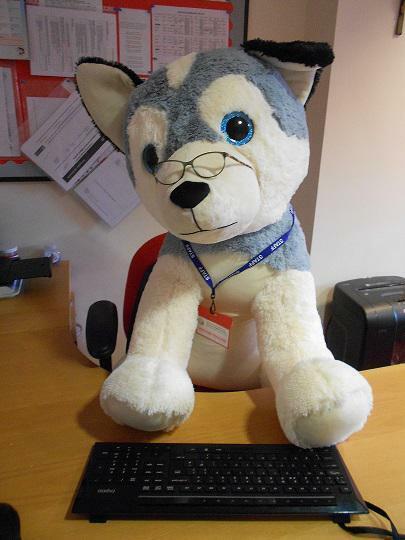 If you can guess the name of the Husky Toy you will be able to take him home for keeps. All you need to do is think of a name, bring in your £1 donation and fill in a guessing slip - any day next week. The winner will be announced on Friday and all proceeds will go to Children In Need. Also, don't forget that on Friday November 17th children and grown ups are encouraged to wear their PJs and donate £1 to this very worthwhile cause. Finally, there a box in the School Office for Pudsey's Round Pound Countdown; so your can donate any old pound coins you may still have.